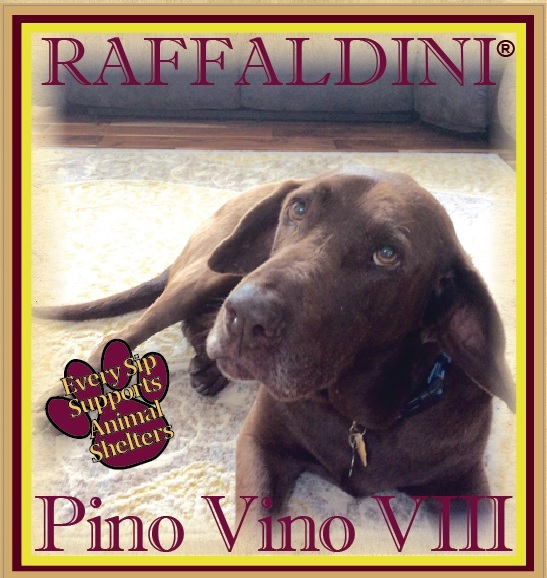 This month Raffaldini Vineyards turns 17 years old! We are grateful to all our fans for the many years of ongoing support. 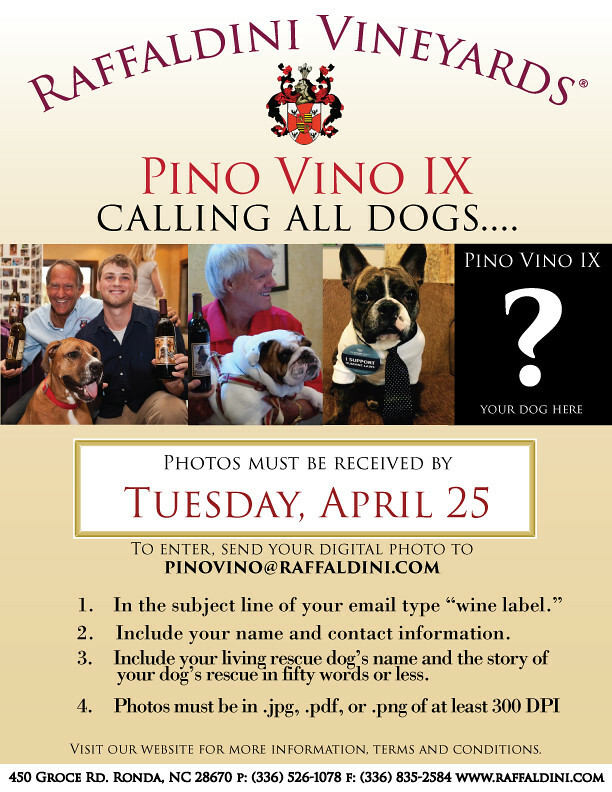 Stop by the Villa this month and raise a toast to Raffaldini! Check out our events calendar for a full list of upcoming events. The 2015 vintage of Grande Riserva is a select blend of Montepulciano, Sagrantino, and Petit Verdot, harvested at optimal ripeness, triple sorted, and then dried using the Appassimento method, creating a wine that is rich, smooth, and intriguing sip after sip. We are excited to introduce our Classico Club Annual tasting pass. Our Classico Club is an annual, individual tasting pass and entitles the member to one tasting or one glass of wine with each visit to Villa Raffaldini all year long. Makes a great gift! 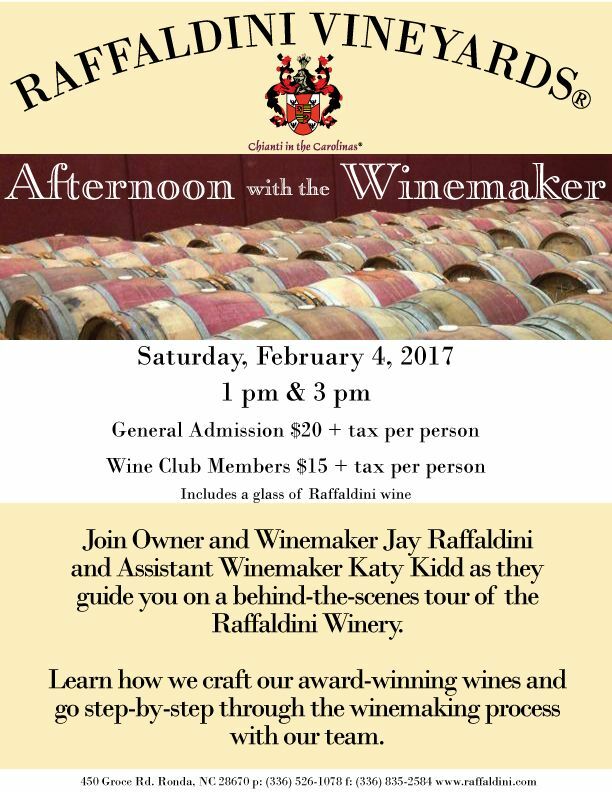 Join Owner Jay Raffaldini and Winemakers Katy Kidd and Mat Worrell as they guide you on a behind-the-scenes tour of the Raffaldini Winery. Learn how we craft our award-winning wines and go step-by-step through the winemaking process with our team. Make plans now to attend the North Carolina wine industry's biggest event of the year. The NC Fine Wines Competition is the toughest state-specific competition in the country, and you can be side-by-side with owners and winemakers from across the state when the coveted NC Fine Wines case awards are announced! Dress to impress, walk the red carpet and attend the awards ceremony and exquisite dinner paired with NC Fine Wines. The event will host the biggest and brightest stars in the industry, and there is a limited allocation of seating open to the public. 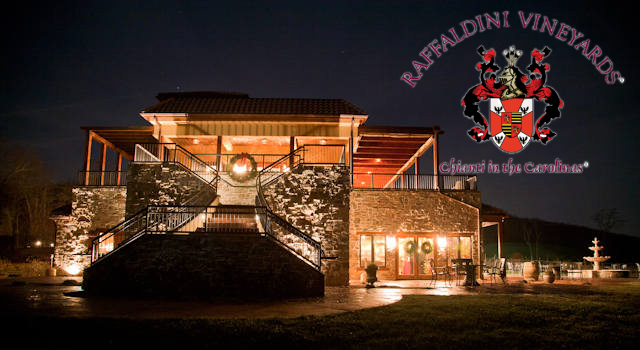 Raffaldini Vineyards joins the Triad Business Journal and UNCG to celebrate young leaders in our business community. The Top Forty Leaders Under Forty recognizes innovative talent driving the Piedmont Triad workforce in 2018. This annual celebration is hosted at UNCG's Elliott Center and features Raffaldini Wine. For event info, click here. I hope this email finds everyone happy and healthy after a joyful holiday season with loved ones. I rarely send out emails to our wine club members unless there is something noteworthy to report. 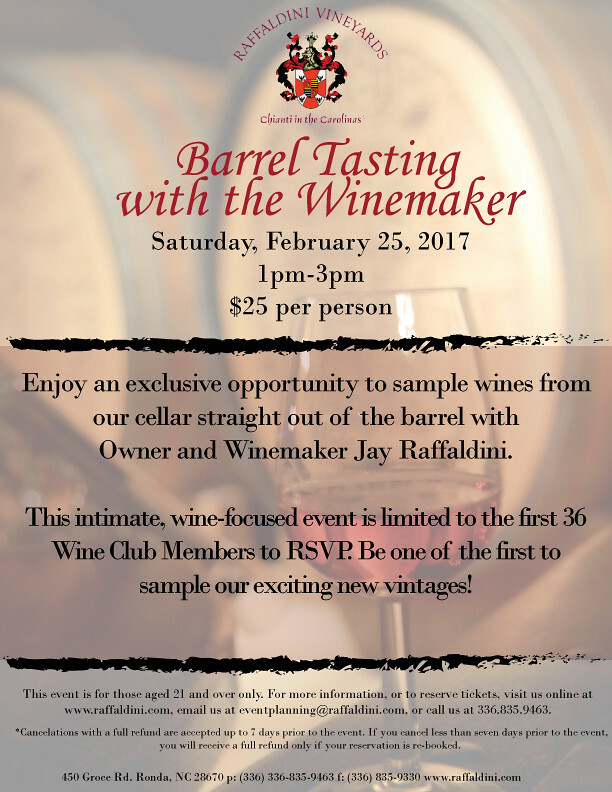 I have some exciting updates about La Famiglia Raffaldini Wine Club. I am happy to announce that we are introducing a tiered wine club so that you will have the option to select your desired experience. I am grateful for your support and appreciation of our wines. The Classico Tasting Pass is an annual, individual tasting pass, which entitles a member to one tasting or one glass of wine with each visit to the Villa. There are no restrictions on the number of visits per year. The annual charge is $180 per person. For sign ups during the year, the annual fee will be prorated on a monthly basis. A special Classico Club member card will be made for you annually. The Superiore Club wine club will consist of a semi-annual selection of six bottles chosen by me plus any six bottles you choose. You will receive a Superiore Club exclusive of 10% discount on your purchase of 12 bottles or more, and 15% off when you purchase 24 bottles or more. Two Classico Tasting Passes are included with your membership. 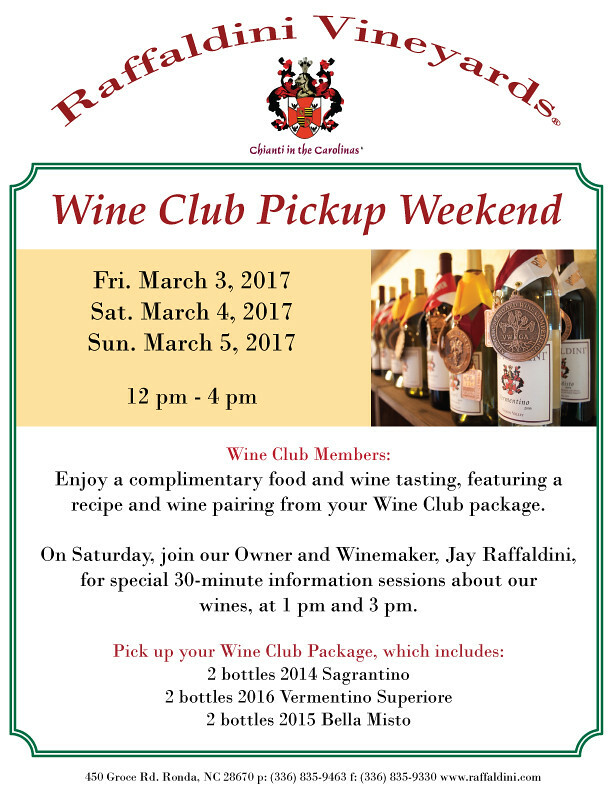 You will receive Superiore Club-member only pricing on select Raffaldini events. A special Superiore Club member card will be made for you annually. The Riserva Club, our elite level club, is designed for the top 10% of our wine-buying members based upon wine purchase levels and meeting the annual Superiore Club purchase requirements. In addition to the benefits of the Classico Tasting Pass and Superiore Club levels, Riserva Club members will have access to events with me as I release older vintages. You will have priority seating at dinners and at the villa (with notice). There will be discounts at the inn and cottages and its restaurant once operational. A Raffaldini Team member will notify you if you qualify for this level and provide further information about the Riserva Club. A special Riserva Club member card will be made for you. All existing wine club members will continue to receive all current wine club benefits until the next release in March 2018. Thank you again for your belief and commitment to our dedication to quality. 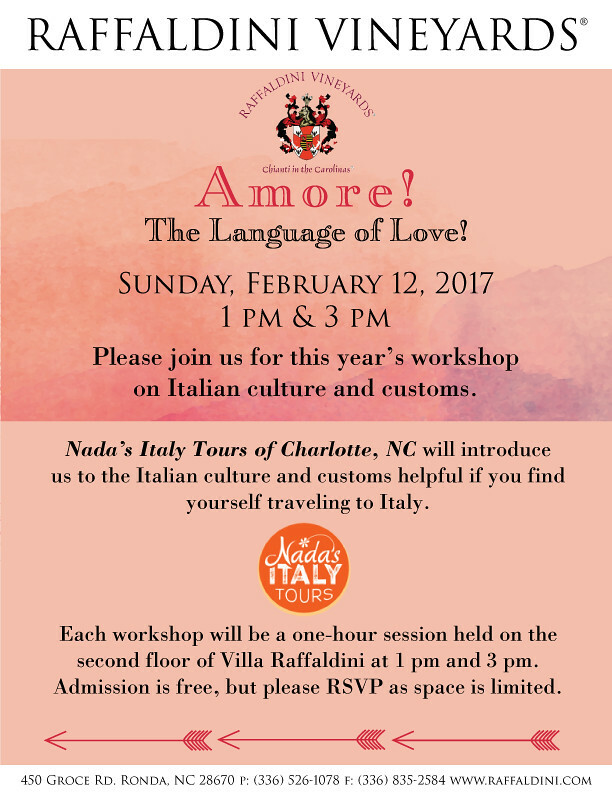 If you have any questions please so not hesitate to contact my Tasting Room Manager Thomas Salley at thomas@raffaldini.com or 336.835.1547. It's here! The wine release you have all been waiting for, the 2015 vintage of our Grande Riserva is available for purchase. Our Grande Riserva is a select blend of Montepulciano, Sagrantino, and Petit Verdot, harvested at optimal ripeness, triple sorted, and then dried using the Appassimento method, creating a wine that is rich, smooth, and intriguing sip after sip. 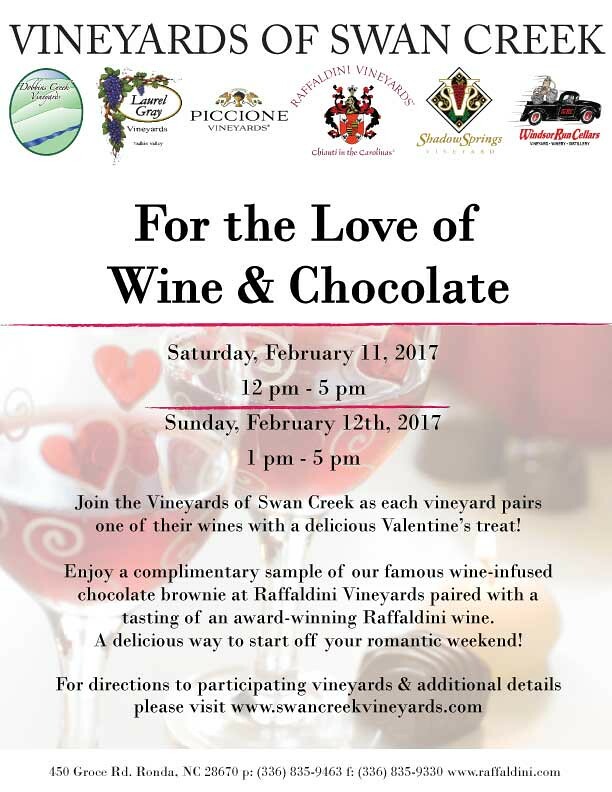 We are excited to offer a unique opportunity to enjoy Raffaldini Vineyards year-round! Our Classico Club is an annual, individual tasting pass and entitles the member to one tasting or one glass of wine with each visit to Villa Raffaldini all year long. Makes a great gift! Join us for an afternoon of wine and food as popular local chef Tony Costagliola from Amalfi's of Wilkesboro will demonstrate some of his favorite Italian recipes. Learn some helpful tips from the pros and watch Tony prepare hand made Italian classics right in front of your eyes! Inter-Faith Food Shuttle is a nonpartisan, non-profit member of the Feeding America National Network of Food Banks that recovers and distributes food to low-income neighbors and provides programs designed to empower people with skills to meet their own food needs through culinary job training, beginner gardening, and cooking healthy on a budget. North Carolina is the 8th hungriest state in the U.S. In the Triangle, more than 260,000 people are food insecure and may not know where their next meal is coming from. We believe in building a community food system that supports all of its residents with knowledge, skills, and access to healthy eating.